We showed you so many times the operational flexibility of our Octopus vacuum gripping system. Here you can see it at work in a new application: the palletization of hydrocarbon bins. Please, note the stability and the precision with which the robot takes the bins and releases them onto the pallet, in rows of 5. Details that are very important when dealing with similar materials. For this special Octopus configuration, each bin has a maximum weight of 30 kilograms, with a total grip of 150 kilos. The most interesting feature of the Octopus is that, should you change the load, you should not reposition the suction cups, even if the surface of the objects to be taken occupy only 5% of the entire suction plane (provided that the load does not have an excessive transpiration or does not exceed the maximum weight proportional to the grip surface). 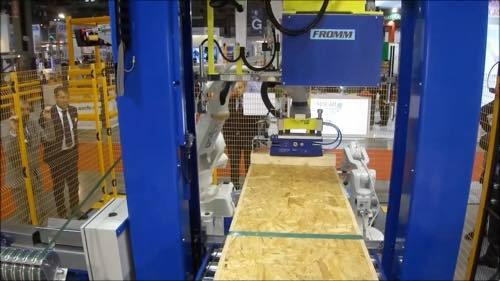 This time we find ourselves in a company, where a robot works independently in the creation of pallets. As you can see, each box is brought to its place without problems or interruptions and in an orderly manner, but this would not have been possible without the use of the Octopus gripping hands. Only our vacuum gripping system allows, in fact, to take boxes of different weight, shape and dimensions. And without having to place the suction cups every time, since, as you already know if you followed us these years, Octopus works very well even when the intake surface occupies only 5% of the suction plate. You can save time and resources, this way. Sometimes you do not seize the opportunities, because you do not know them. This often happens in the field of extruders, where the manipulation of bricks and materials is still too often performed with mechanical grippers that have very high costs ensuring a lower operating flexibility than Vuototenica solution you can see in the video below. Once again Octopus vacuum gripping superhero, comes to your rescue. 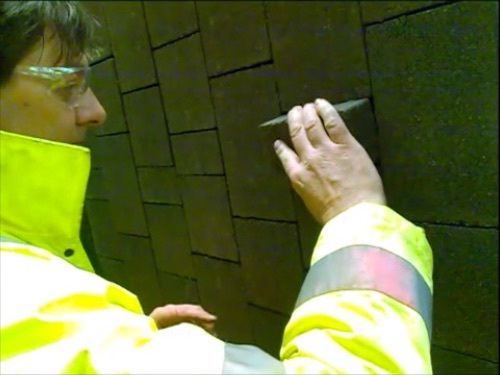 Thanks to its flexibility, it is able to manipulate bricks of different shapes and weight in a very safe way. 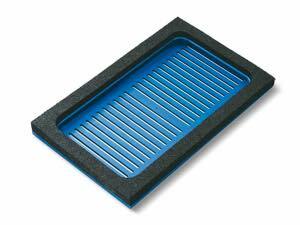 The gripping plate is in foamed rubber and fits in a mimetic way to the shape of objects to be taken. And the most interesting thing is that there is no need to change or replace suction cups, even when their surface occupies only 5% of the suction plate. Their strength is unrivaled and they do not need any special maintenance. A great advantage in terms of cost and time. To learn about Octopus, contact Vuototecnica designers, no commitment, and you’ll discover how to save money by getting a flexible solution which fits to your needs. 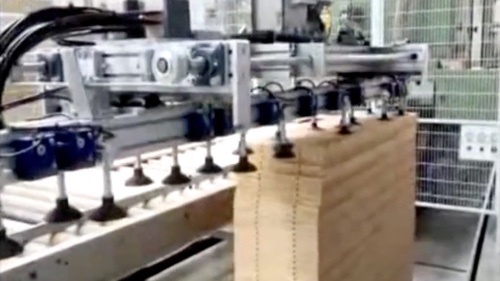 You can see Vuototecnica Octopus vacuum gripping system in this video; it is integrated on an anthropomorphic robot which deals with the management of wooden bars. 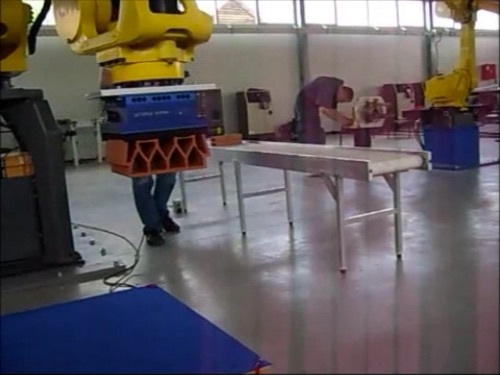 As you can see, the wooden bars are removed very easily from the robot, to be placed elsewhere and finally blocked by a strapping tape. In this application, the bars function as support or spacers for overlapping several crates. The aim is to build solid wood structures for packaging, in a safe and firm way. It seems so simple to see, that you never sospect there are many hours of work by Vuototecnica designers and staff behind this application, to produce a top product. Octopus is simple for the end user but it is a highly sophisticated device. 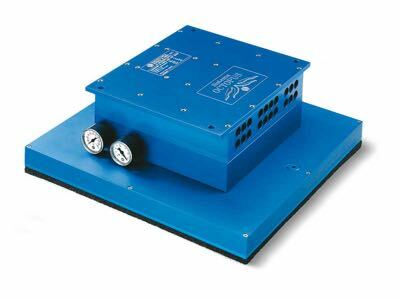 It works even when the object to be taken occupies only 5% of the vacuum table and it is built with quality materials. Octopus bar you can see in this video is perfectly suited to the irregularity of the wood surface, thanks to the presence of foam rubber, which provides excellent gripping. You can also note how little space the bar occupies, it hosts already the source of vacuum on board (a Vuototecnica pneumatic vacuum generator with multiples ejectors). 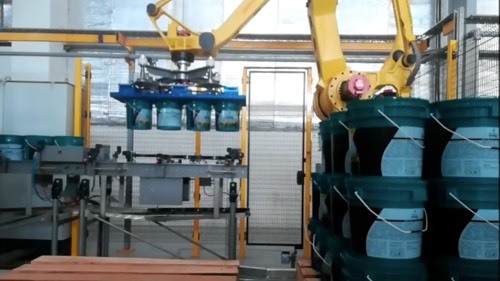 The compressed air passes through the links already built into the robot simplifying the distribution circuit and avoiding harmful and delicate external tubing that would otherwise limit the rotation and the movement of the robotic arm. There is also a vacuum switch on the bar for controlling the outlet in each step. 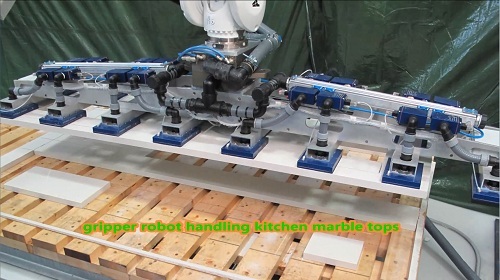 The palletising robot you can see in the video is concerned with the arrangement of lists of wood thanks to Vuototecnica BO 12120 X Octopus bar with an extraordinary simple operation. Typically when assembling external vacuum generating units, such as the classic side channels aspirators, there are several problems to be dealt with. As well as being noisy, aspirators force to bring big and bulky vacuum pipes to the gripping hand (with inner sections of 40/50 mm), restricting the movements of the robot wrist. With Vuototecnica vacuum gripping system instead, as you can see, the customer used the standard 8.6 mm compressed air distribution ducts inside the anthropomorphic robot, to power the multistage venturi placed directly on the Octopus bar. Do you see the system increased cleanliness? The movement of the robot has no obstacle and runs smoothly. It is possible, by doing so, to provide for a blow-off within the Octopus bar, when it is necessary to release the listings of wood, for example, when you want to increase the speed or to obtain cleanliness and to remove shavings and wood dust. And the benefits do not end there. All Octopus systems are composed of high quality materials: anodized aluminum for the box; a micro mesh filter on the intake – of easy inspection, in stainless steel – and a wide range of accessories and components and suction plates, depending on the products to be handled. There is no need to reposition the suction cups, Octopus is effective in taking even when the surface of objects to be manipulated only occupies 5% of the suction plate. 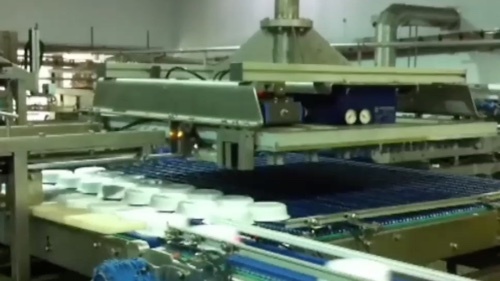 In this video you can see Vuototecnica Octopus vacuum gripping system at work. The most obvious benefit of these special suction cups, as you can see, is that each pack plastic is picked up in a very firm and secure way, although there are sometimes differing heights of gripping. The bellows structure of the suction cups makes it possible to compensate for different levels and take items without problems. Considering instead the step of the transfer of pieces, Octopus is able to offer maximum stability thanks to the excellent degree of vacuum generated by the PVP multistage Venturi mounted on the Octopus device, Vuototecnica branded. Customization is the point of strength of each Vuototecnica solution and that’s why a new center for testing devices and products has been realized; it is equipped with anthropomorphic and gantry robots for the realization of feasibility of gripping. 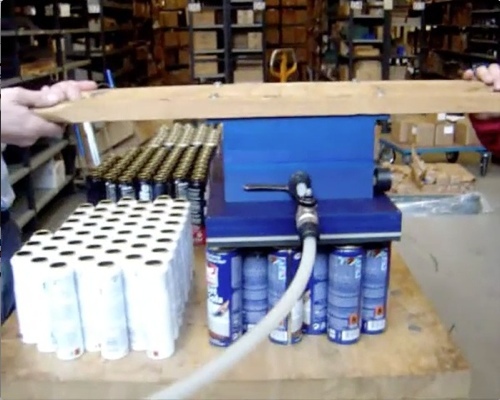 In this video, you can see the feasibility test carried out by a manufacturer, a robots assessment technician, that required the ability to handle spray cans of different sizes. Octopus vacuum gripping system allows a rigid and stable manipulation of cans of different sizes, with one dedicated gripping head. This solution guaranteed the final customer to eliminate the plastic straps which are usually used to hold together each group of cans, with great savings, also in terms of time, as a result. When competitors merely offer standard components from the catalogue, Vuototecnica adapts its solutions for you. When there is a need for very fast cycles for small objects manipulation with Flex Picker robots, you need clamps and vacuum gripping hands capable of adapting to required formats. In this video, you can see Vuototecnica Octopus vacuum gripping plate in SO DO 10X special version. t is round shaped and small size (100 mm diameter) but, as you can see, it guarantees the same advantages of other Octopus solutions. is that there is no need to reposition the suction cups even when the surface to be taken occupy only 5% of the gripping plate. Octopus vacuum gripping systems can operate vertically, horizontally, inclined and even upside down with respect to the gripping plane and they are made in resistant and low maintenance materials, such as anodized aluminum. A multistage low consumption of air ejector is installed on the machine for the rapid generation of vacuum by means of a simple valve for compressed air handled by the customer. Vuototecnica produces tailored heads for individual pieces; there are also plastic material (Pom) versions in order to limit the weight. Extreme personalization, according to the needs of the customer. Octopus PJ vacuum gripping plates have extreme operational flexibility and we have been shown you some popular applications, including the taking of bags with liquid or bulk products; and we also pointed out a big advantage: thanks to a delicate operation, Octopus does not break the packs, although it does the job quickly and safely. Unless you require it. What do we mean? In this video you can see Octopus PJ in a new version. Here, the Octopus head picks the sack full of product from the pallet and compresses it on a sharp tool in order to open the sack and store the powder in a container. The empty bag is held and then released in the given area with ease. The vacuum generator, here located on the Octopus head, is fed pneumatically through robot standard pneumatic ducts. As you can see, the gripping hand is very rational and compact. The deformation of the bag is almost equal to zero with minimum loss of vacuum. The lifting force is calculated considering a vacuum level of at least -75 Kpa. Then there is the maximum customization of the product. The plates are made ​​of anodized aluminum and you can replace them if necessary with others, in different sizes and shapes, in a simple way. Do you want to replicate this application or try a new one? Contact our staff to customize the product according to your needs. 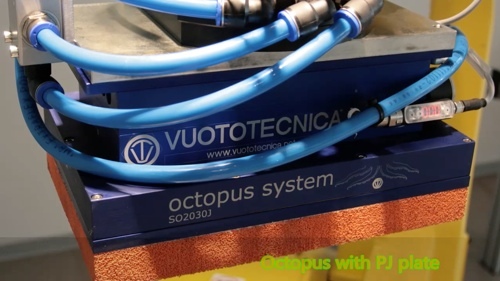 In this video, you can see a Vuototecnica Octopus vacuum gripping system with a PJ suction plate in action. It is perfect for handling bulk products packs containing liquids, such as in the case of these mozzarella packs. As you can imagine, this is a very delicate process, because the gripping surface is not uniform in weight and shape. And yet Octopus perfectly adapts to robots operating speed, it is gentle on the packs, thus avoiding unwanted operating stops and losses. The package is not deformed because the plates gasket and their gripping surface allow to limit the deformation of the pack, thus reducing the loss of vacuum to the minimum. PJ plates are made of anodized aluminum, are very durable, and have a rubber sponge gasket. They are also suitable for the gripping of plastic bags containing in powdered and granulated products. 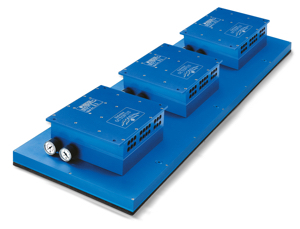 The lifting force is calculated considering a vacuum level of at least -75 Kpa. In addition, they are available in different sizes depending on the load to be lifted. And if you wish to repurpose your robots for other applications, you can replace them in a very simple and straightforward way. We have often considered the countless advantages of Vuototecnica Octopus system. What makes it a successful product is the ability to adapt to the needs of producers. 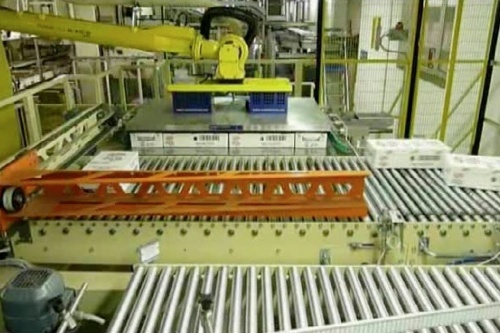 A unique and very valuable response prompted to operational flexibility for palletizing robots and, in general, for vacuum gripping systems, because you just change the plates and you find quickly a different product, useful for another application. In the video, you can see one of the several applications: our SO 20 30 J Octopus with PVP 140 MPO vacuum generator. A PJ suction plate was mounted to this Octopus, a plate which is perfect for gripping plastic or paper bags containing bulk products, such as pasta. Octopus does its job very well without causing breakage. The load is safe! Without unwanted downtime or not budgeted economic handicaps. The pack, as you can see, is not deformed and the loss of vacuum is minimized. In addition, the plates were selected in the perfect size for these packs. Their workmanship is not to be underestimated, it leads to operational and maintenance advantages: they are made ​​of anodized aluminum and are equipped with special rubber sponge gasket, for a more effective grip; and you can replace them, in a very simple and fast way, with other Octopus standard plates. 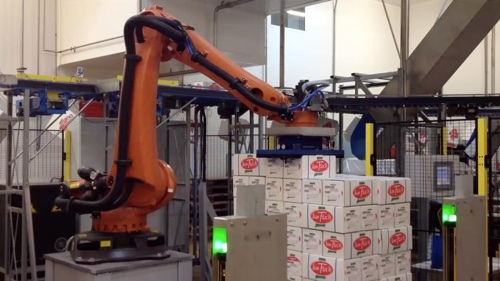 In this video you can see a palletizer robot in action, which uses the innovative SO 40 60 X Octopus by Vuototecnica. Octopus is a range of vacuum gripping systems, with a wide assortment of accessories and components, designed as a practical response to the need for palletizing and de-palletizing in various sectors of industry. As you can see, it is ideal to stack and un-stack cartons, sacks and boxes, ensuring the grip of the carton interlayers and of wooden pallets, too. Thanks to Octopus, Vuototecnica is able to ensure the grip, in maximum safety, without having to replace suction cups every time: it is great, in fact, even when the surface of the objects to manipulate occupies only 5% of the suction plate. 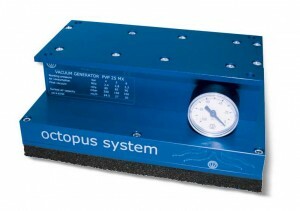 All Octopus systems are composed of a vacuum generator powered by compressed air; a box in anodized aluminum; a stainless steel mesh microfine filter on the intake, easily inspectable, to protect the generator; and, finally, the suction plate, able to adapt perfectly to any surface to be taken, whether it is smooth, rough or irregular. Octopus provides a very wide choice of suction plates in different materials and shapes, according to use. The customer can choose between spongy gums or suction cups and additional components, such as shut-off valves, to open the suction only when in contact with the product to be handled, or suction plates with calibrated and self-cleaning micro holes, suitable for dusty environments. Octopus vacuum gripping systems can operate vertically, horizontally, inclined and even upside down respect to objects gripping surface. Several issues have been resolved, on the need for palletizing and de-palletizing in a lot of industries, since Vuototecnica Octopus vacuum gripping systems range is in production. You can stack or unstack boxes, bags, packs, with Octopus, ensuring the grip of cardboard interlayer and wooden pallets. A solution that assures you the grip, in total safety, even when the object gripping surface only occupies 5% of suction plan. And all that without having to reposition suction cups every time. Octopus basic systems are composed of a vacuum generator powered by compressed air; a box in anodized aluminum; a microfine filter, easy to inspect, on the intake to protect the generator; a suction plate, that you can choose from a very wide range of solutions and which adapts to any surface – smooth, rough or uneven. Octopus major benefit is that it can operate vertically, horizontally, inclined or even upside down respect to objects gripping surface. In addition there are lots of accessories and components: spongy gums, suction cups, shut-off valves, suction plates with micro-calibrated and self-cleaning holes, which are also suitable for dusty environments. Vuototecnica is able to provide maximum customization. Special versions of Octopus gripping systems are a prime example. 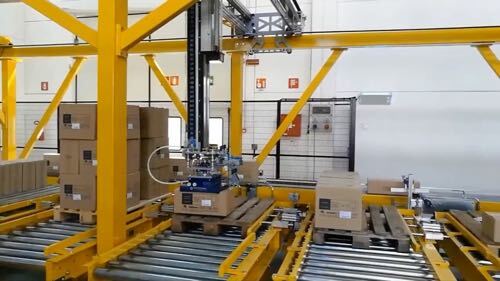 Octopus multi-chamber version, for example, allows palletizer robots on which it is mounted, taking and storage of different types of boxes, to compose pallets with different layers and provide maximum flexibility to the end customer. You can get a similar result with a remote electric pump as vacuum source, and its distribution through servo-operated solenoid valves (07 … 11 series) located on each chamber. The chamber can be equipped with shut-off valves to concentrate vacuum degree only on suction cups which are in real contact with boxes to be palletized, avoiding unnecessary wastage and ensuring maximum efficiency. When handling marble and granite kitchen tops it is important to proceed safely to avoid damaging the surfaces. Any malfunctions would cause issues in terms of costs for the manufacturing companies and in terms of quality for buyers. 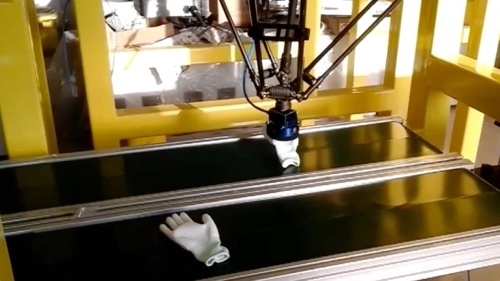 In the video, it is possible to see with your very own eyes, the effectiveness of the Vuototecnica Octopus vacuum gripping system, presented in the SO1520XM5 version, mounted to the wrist of an anthropomorphic robot. Equipped with great operational flexibility, Octopus enables the gripping of smooth or rough surfaces without having to replace and re-position the suction cups each time. Thanks to Vuototecnica self-closing valves technology, built into the boxed suction, the Octopus system is able to offer grip even where only 5% of the vacuum surface of the product to be handled, is available; the operational pliancy offered is based upon the different shapes and sizes of the objects. 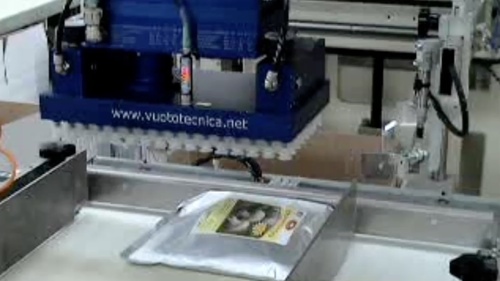 Vuototecnica offers different Octopus systems: standard, which you are able to find online alongside the product specifications, however, as depicted with the attached footage, the Company is able to develop and create custom (even one off pieces) Octopus heads based upon the operational requirements of end users. The Octopus systems are easily inspected and made using quality materials; already prepared for the installation of control tools or solenoid valves. Among the many successes achieved by Vuototecnica, we shall highlight one that is particularly outstanding. With the English branch, Vuototecnica UK, was recently designed for a known producer of bricks and paving, a system for handling different types of bricks with a single Octopus gripping head. 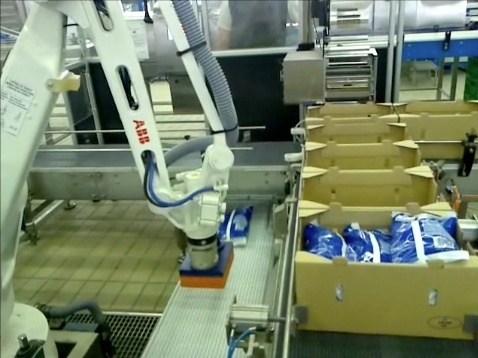 Octopus has permitted the depalletiser robot to work continuously, even in a highly dusty environment, such as that of production. The savings and end productivity have been greatly increased, without the need for costly downtime to adapt the suction plate to the different brick formats. The Octopus depression gripping systems are the most flexible response for the palletising robot and depression gripping systems in general and in fact enable the gripping of objects of any shape and size. The greatest advantage is that there is no need to change or reposition the suction cups during the working phases. In September, the rice is collected. ThroughoutItaly, operators of the sector are engaged in activities of selection and packaging of this food that will then be the king of winter tables. 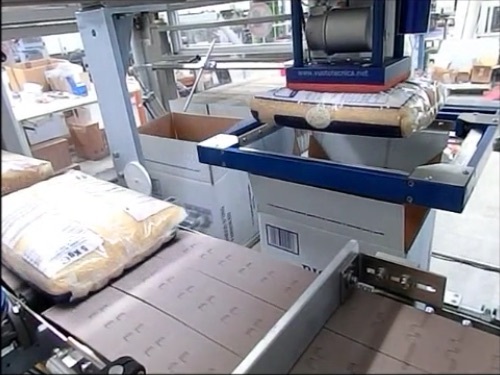 Once packaged, however, it must be distributed, necessitating palletising robots able to manipulate very heavy sacks and to insert them without damaging into boxes intended for end distributors. 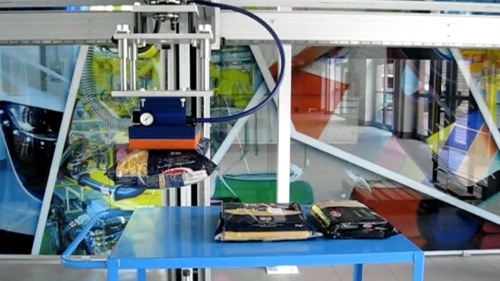 Vuototecnica proposes an innovative Octopus vacuum gripper system with suction plates specially created for the gripping of paper or plastic sacks containing cereals, powders, loose products or liquids. The suction plates have a spongy seal which limits deformations of the sack while gripping and guarantees uniform contact with the entire surface thus avoiding tearing of the package and problematic vacuum leaks. The spongy rubber maintains its elasticity even after many work cycles, is self-adhesive, easily replaceable and is made of a special compound that also allows gripping on very irregular surfaces. When working in dusty environments such as in the case of agricultural and food companies, it is important to prevent the problematic stoppage of gripping systems. Vuototecnica has also thought of this and Octopus provides self-cleaning micro-holes on the suction plates. The dust that is inevitably suctioned through the micro-holes is instead trapped by a filter disc made of stainless steel mesh, located inside the bar base box which in any case permits easy inspection for cleaning. The very fine dust, impossible for the filter disc to trap, is ultimately suctioned and expelled by the vacuum generator.